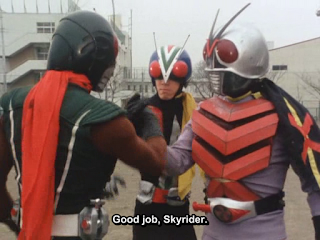 KITsubs: Kamen Rider Skyrider Episode 26! Kamen Rider Skyrider Episode 26! As much of a spoiler as that picture looks like it is, it really isn't. This episodes is played for jokes a lot of the time, and the whole thing just seems like filler. Granted, it's filler that builds up to next episode (which, if you stick around for the next episode preview, you'll see why that's so cool) so we can forgive it. The story here is really all over the place. NeoShocker plans to unleash a viral epidemic. But also they want to turn schools into fortresses to surround Tokyo. We see AntCommandos acting silly, Hiroshi fighting with chains (more than once) and X and Riderman teaming up for no apparent reason whatsoever. But it's all in good fun! And the fight scenes in this episode are top notch. And, like I said, next episode is going to be a big one. BUT, we'll have to wait on that one. You guys know how much I like to prolong the wait on these milestone episodes. So next week's episode is Kamen Rider 27! Also, check back in here soon for some news on one of our joint-release projects with Midnight Crew Subs. And thanks for watching, as always! The only difference here is that ba syllable. Normally we'd translate the name to ToxicMothra. The reason being that the DA sound is just a sci-fi-make-em-up sounding syllable. And of course a dokugan is a poisonous moth. But here, there's a pun at work. The ganba here is short for "ganbaru," which is a common japanese phrase you've probably heard in a million different places. With the help of the crew in #sht we tried to figure out what the pun could possibly mean (a hard working moth? a moth made of rocks?) until it finally dawned on me. It can also mean "endure," and tonight's episode is about another poisonous moth... but THIS time the toxin is contagious. So an enduring toxin... like an epidemic! Which is exactly what this episode is about. Being a vocabulary nerd, I went with "MiasMoth." Because of the amorous affect of alliteration, and also because miasma is my favorite obscure word for a viral outbreak. Kamen Rider Skyrider Episode 25! Kamen Rider Skyrider Episode 24, Batch Torrents!